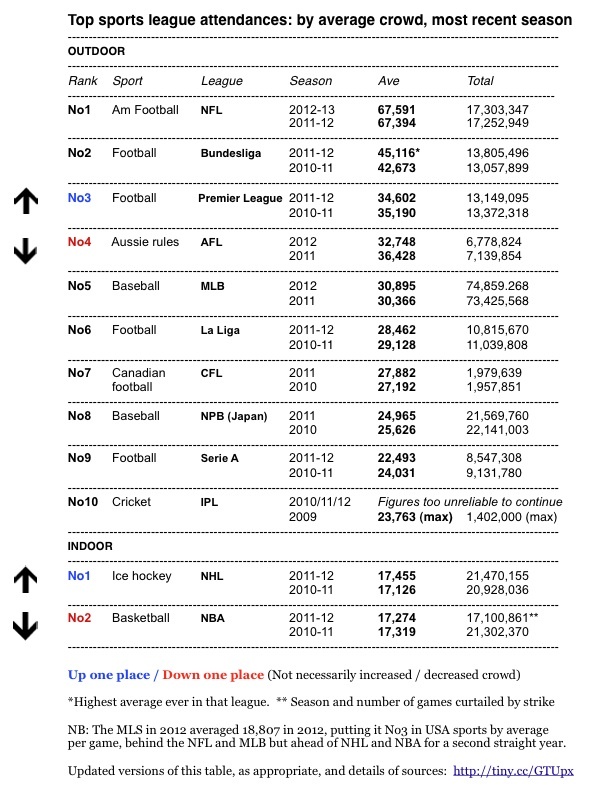 The NFL has increased its attendance levels from an average of 67,394 fans per regular season game in 2011 to 67,591 in 2012, Sportingintelligence can reveal on the eve of the 2012-13 season NFL play-offs. As our updated global attendances league table shows (also below), the new figure keeps the NFL comfortably in the No1 place as the best attended professional domestic sports league in the world, by average attendance per game. There are better attended sports leagues in US College football, as a previous feature on this site explored. 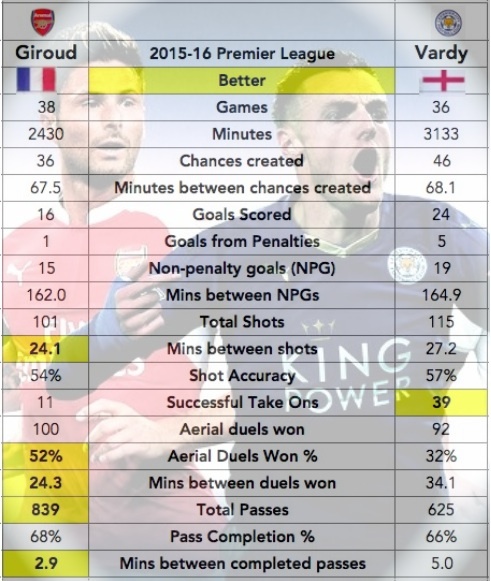 But the NFL holds sway in the world of professional sports. The German Bundesliga’s top division keeps the No2 spot thanks to a new seasonal record of 45,116 fans per game in 2011-12, up from 42,673 the season before. The English Premier League has leapfrogged Australian’s Aussie Rules AFL league into third place. Both those leagues saw season-on-season declines but the decline was sharper in the AFL. The top 10 leagues are shown below, as are the two biggest indoor leagues, the NBA and NHL, with the NHL overtaking the NBA in 2011-12. Big crowds don’t always mean big paydays for the stars involved. The NBA is the best-paid league in the world by average earnings per player. 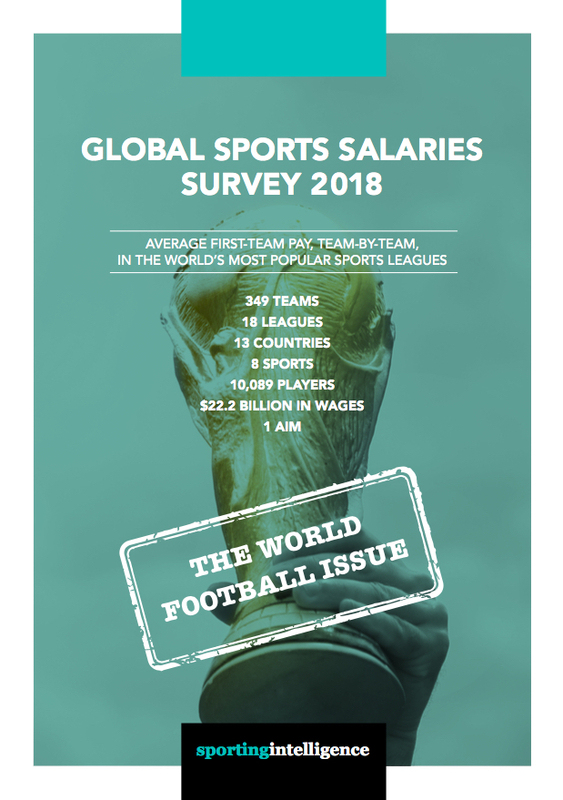 Sportingintelligence’s Global Sports Salary Survey in 2012 showed that MLB baseball players, Premier League football players, Bundesliga footballers and NHL ice hockey stars all had average annual salaries higher than NFL players. MLB baseball attracts more fans in total per season than any pro league in the world (almost 75 million in 2012), but fewer on average per game than the NFL.